On July 13, 2017, Delaware Online reported that two Wilmington men have been charged in connection with a shooting that occurred in April. After an investigation, Wilmington Police Department officials allege that the suspects shot another man in the torso and leg, though no there was no statement regarding motive. The pair both face counts of attempted first-degree murder and weapons crimes, including possession of a firearm during the commission of a felony. A conviction for any type of Weapons Charges in Delaware may carry harsh penalties, so it’s important to understand the implications if you have been arrested under similar circumstances. Under Delaware law, it is a Class B felony to possess a firearm while engaging in felonious activity. This Weapons Charge is actually separate from the underlying felony, which means that it is a crime separate from the original offense. Mandatory minimum laws apply for a Class B felony, and you are facing at least three years in prison for a first offense; still, a judge may sentence you up to 25 years’ incarceration. For a second offense, your mandatory minimum prison sentence is five years. When you are convicted of possession of a firearm during commission of a felony, your sentence will be tacked onto any term you serve for the underlying crime. A closely related offense is possession of a deadly weapon during the commission of a felony, such as a baseball bat or knife. If convicted, you face a minimum two year period of incarceration. 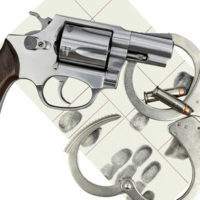 Like possession of firearm charges, the offense is treated as a separate crime and your prison term is tacked onto your sentence for the underlying crime. Typically, possession is defined as having a weapon or firearm on your person, such as by having a gun or knife in your pocket. However, the definition of possession also includes “constructive possess ion.” Constructive possession involves circumstances where you may not have physical possession of contraband, but where you know where it is located, you have access to it, and have the power to control or possess it. For instance, you may be found to possess items located in your car or personal belongings even though not on your person. Therefore, if there is a gun or knife in the glove compartment of your car while you are driving is, there may be grounds for a possession charge. In addition, the definition of possession may lead to weapons charges if someone assisting you in committing a felony has a gun – even if you do not have a firearm on your person. Allegations of Weapons Charges are just that: They may accuse you of certain crimes involving firearms, but they are not an indication of guilt. It is possible to develop a strong defense strategy to fight felony firearm possession, but you need an attorney who has extensive experience and knowledge of criminal law. A lawyer can assist you through the court process, from arrest and arraignment to a full trial in the case. If you are facing Weapons Charges, please contact the office of Michael W. Modica in Wilmington, DE. We can schedule a free, confidential consultation to discuss your case and talk about a criminal defense strategy.